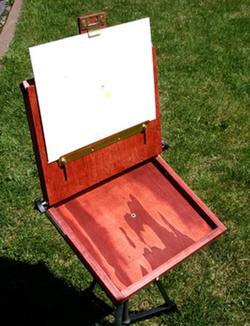 As I pointed out in my previous post on making DIY pochade boxes out of cigar boxes, the cost of a commercial pochade box can sometimes be prohibitive, particularly for those on a tight budget or who are as yet uncertain if they want to commit serious resources to plein air painting. 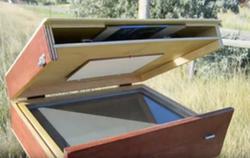 So blog posts and videos in which artists share their designs for Do It Yourself pochade boxes are becoming more common. 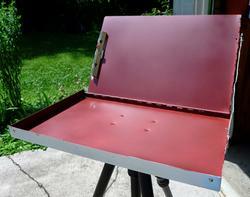 Though the cigar box conversion is the most common, there are also more ambitious designs either built from scratch materials or from larger found wooden boxes, as well as some unorthodox starting points like office form holders and even a laptop computer shell. I’ve gathered a few of them here — certainly not comprehensive, but hopefully representative and useful. Some are quite detailed and extensive in their descriptions and instructions, others are a bit sketchy, but I’ve tried to include those that have techniques of interest. Some even offer printed plans, either for free or for a reasonable fee. Though there are some exceptions, most of these posts and videos are less than professionally presented. 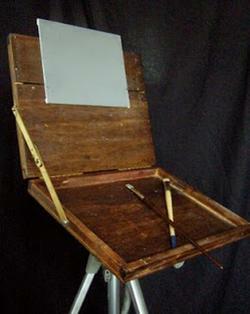 For an alternative with details and high production values, see my recent post about James Gurney’s new video on How to Make a Sketch Easel. Look around with a search engine (particularly by using image search) and you will likely find more posts and videos on DIY pochade boxes; even those without details can offer food for thought. For those who have accounts, you may find additional resources on sites like Wet Canvas or Pinterest. I’ll follow up this post in the next few days with a refreshed version of my original post on Pochade Boxes, that offers an overview of commercially available options. 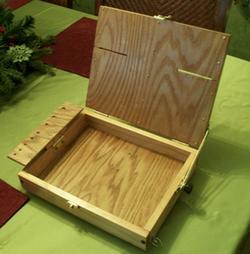 This influential 2009 post on how to build a “Sterrett Box”, as it came to be called, was the second DIY pochade box I remember seeing on the web, after Ellie Clemon’s cigar box pochade box post in 2004 (see my previous article on DIY Cigar Box pochade boxes). 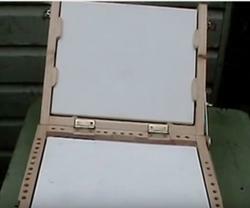 Sterrett also published a post on diy pochade boxes by others inspired by his design, and another on his plans for making a wet panel carrier. Not really a blog post, but a series of annotated photos on Flickr, this is also one of the older examples I’m aware of in which an artist shares their home made pochade box design. 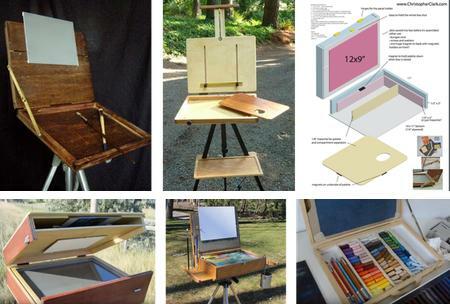 Made from cut lumber, this box will take panels up to 18 inches and includes a camera mount for taking time-lapse shots of paintings in progress. 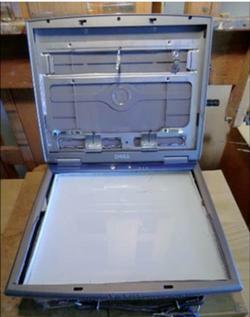 This 9 1/4 x 11 1/2″ box, meant to handle 8 x 10 panels, features a tip-out hinged brush holder. 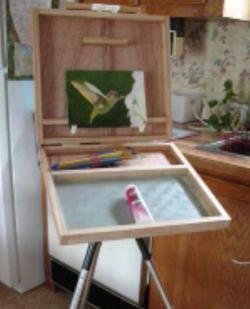 This box starts out with two 12×16 cradled birch painting panels, and provides a large mixing area. Directions are fairly extensive and it looks like the size could likely be easily reduced by using smaller panels. In this unusual metal design, the starting point is an aluminum form holder and the end result is very lightweight. 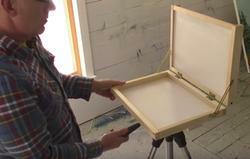 In this two part video (part 2 here), the artist starts out with a found wooden box (larger than a cigar box, eBay maybe? 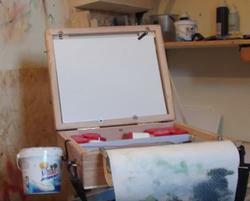 ), but gives worthwhile ideas and details for the hardware and compartment adaptations to make a pochade box suitable for either oil or watercolor. Geekie has apparently gone through several iterations of his design, and you may find additional details, as well as alternate designs in other videos. Videos are hand-held and a bit shaky, but I thought the designs interesting enough to be worth sharing. 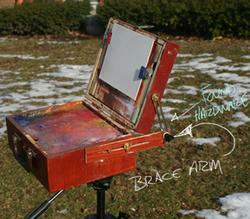 In this unusual bit of recycling, McLain takes the screen and components out of a defunct laptop computer and turns its case into pochade box without a tripod mount, simply held on a lap, table or stool. 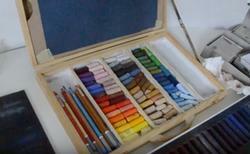 In this annotated time-lapse video, Carli starts with a found wooden box, but gives enough information to be useful in building a pastel-specific pochade box. Video is wordless and annotated in German and English, with enough interesting ideas to be worthwhile. In this basic design, panels are held in place with a simple spring clamp, but the box looks sturdy, has double brackets to hold the lid in place and features panel storage. Ruthven’s video is more an annotated demo than instructions, but the box is quite nicely designed. Tension for the panel holder is provided by a bungee cord. A short, wordless annotated video, but the details are in the Comments area — Click on “Show More” under the video. Includes links to additional detail photos on Flickr. 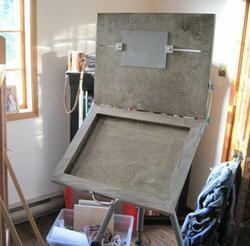 This long running site started with a set of plans for a pochade box that the author called “The Ttanium Easel” (at left). It features slide-out shelves and a lift-out under-palette tray for either panels or materials. Perrish has expanded the offerings over time to include plans for a dedicated pastel box, a watercolor box and a lighter variation pochade box without the storage compartment but with a detachable side tray. 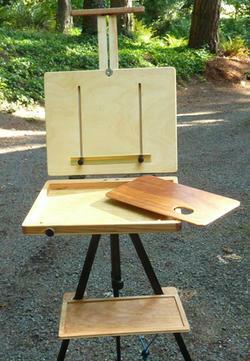 He also offers plans for actual in-studio easels. He describes the plans here. As of this writing, his pochade box plans sell for $20.00. In addition to his blog post, on which he offers free PDF plans, Clark also has a YouTube video about his DIY pochade box. In an extensive post on the Muddy Colors group blog, Howard Lyon gives detailed instructions, a parts list and free diagram images with materials and sizes. 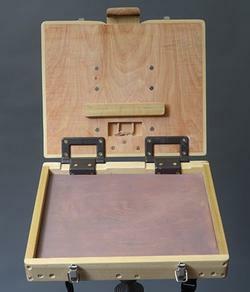 The box features extra strong hinges, and an adjustable panel holder system using magnets to position the base and an extendable top holder tensioned by rubber bands. 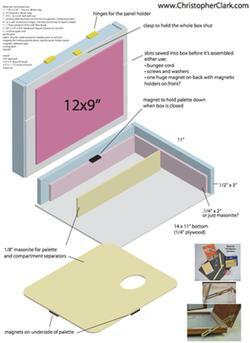 After some initial versions and revisions demonstrated in YouTube videos (and here), Barrage outlined his DIY pochade box process in a blog post, and now offers downloadable plans for $2.99 through Lulu. Although a regular reader, I haven’t commented…so thank you very much for all this research into pochade boxes. I paint in both oil and watercolor and have so far been a plein aire wuss. 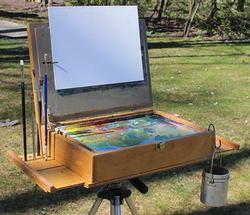 I love the idea of an inexpensive way to see if I really will commit time to plein aire before investing! Thanks, jeanette. It’s good to know you found the post of value.